^ Sherwood, Jennifer & Pevsner, Nikolaus. The Buildings of England: Oxfordshire. Penguin Books. 1974: 128, 181, 232, 287, 301, 302, 303, 325. ISBN 0-14-071045-0. ^ Tyack, Geoffrey. Oxford: an architectural guide. Oxford University Press. 1998: 2, 22, 243, 291, 297, 307. ISBN 0-14-071045-0. 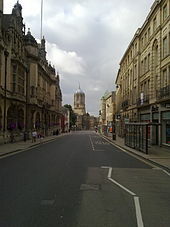 ^ Street-Names, A History of the County of Oxford. Vol. 4, The City of Oxford (1979), pp. 475-477.